Our next concert is at the beautiful Lumen Church this Saturday. We hope to see you there! Tickets available at https://www.eventbrite.com/e/the-space-of-spirit-tickets-45255201526 10 months 2 weeks ago. Tune in to Resonance 104.4fm at 3pm to hear us discuss our two upcoming concerts. For more information about our May and June dates, visit our website: http://www.vocalconstructivists.com/upcoming-performances/ 11 months 3 weeks ago. Vocal Constructivists was live. Lullaby for Pauline (2nd half) 2 years 1 month ago. Vocal Constructivists was live. Lullaby for Pauline (1st half) 2 years 1 month ago. We're running about 15 mins late with our live stream, but we'll be with you at 20.15 GMT! See you then. 2 years 1 month ago. 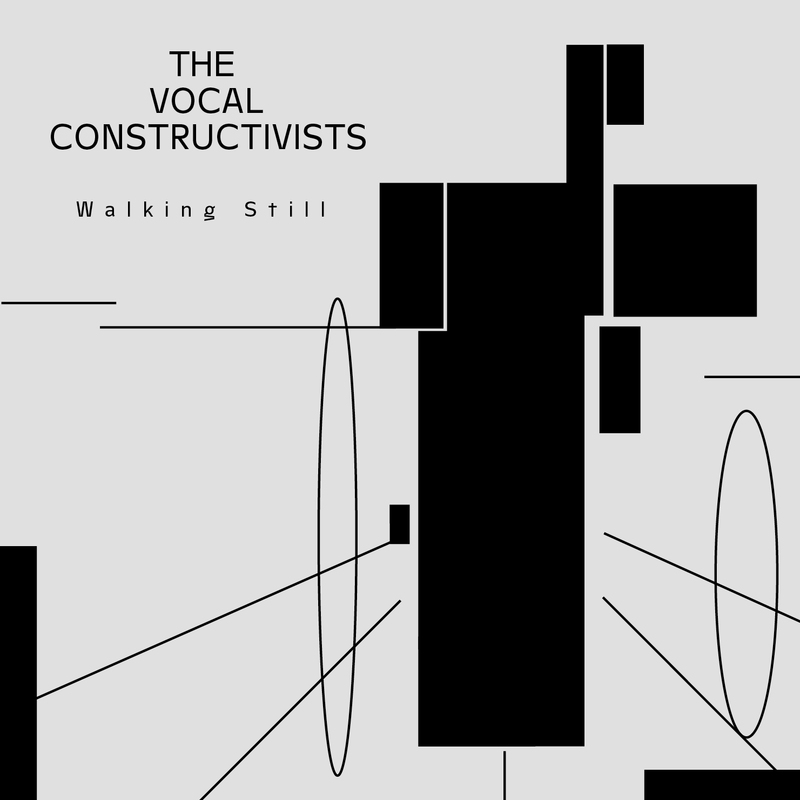 The Vocal Constructivists roar, whoop, snap, and flutter their way into the experimental music world with their debut album, Walking Still. Formed in 2011, the group has brought the exuberance and playfulness of experimental music to live audiences in England and America with their sung interpretations of graphic and text scores. Ranging in age from 18 to 72, members come from a variety of musical backgrounds and draw on classical, global, avant-garde, and performance art traditions. All musical decisions are made by members of the group, worked out in collaboration. Walking Still juxtaposes British and American composers from three different generations (born in the 1930s, 1950s/60s, and the 1980s). It offers the first choral recording of Cornelius Cardew’s Treatise (1964­–67). The Vocal Constructivists’ passionate and imaginative rendering demonstrates the flexibility of this most iconic of graphic scores. Only one work on the album has been previously recorded: Pauline Oliveros’ Sound Patterns, in 1967. Ronald Kuivila’s A City of No Allusions (2012) and Michael Parsons’ Nevrazumitelny (2013) were written for the Vocal Constructivists, while Mark Applebaum’s Medium (2008) and Lauren Redhead’s concerto (2011) are both notated for any instrumentation. The Vocal Constructivists liberate experimental music from the strait-jacket of an expected sound world. Their inventive realisations make open scores accessible to established and new audiences alike. Their sound palette ranges from the English choral tradition to the extended vocal techniques of European modernism, John Cage, and the Scratch Orchestra. The familiar is reimagined and the unfamiliar given a framework for comprehension. "Walking Still tops my list of current releases ... The choir tackles these compositions with a mixture of enthusiasm, commitment and awareness that succeeds in welcoming the listener into some very demanding musical and textual environments, offering asn enlightening and elevating listening experience." "[A] group of exceptionally gifted singers who are at one with each other and, while given great freedom by the composer, can be controlled, expressive, rhythmic and, above all, musical. ... [T]he evocative sonorities of Ronald Kuivila's 'A City of no Allusions' [are] memorable, and Michael Parson's 'Nevrazumiteiny' was expressive and perceptive. It's not an easy listen, and not always comfortable, but slowly this is the way music is going." "[T]he sustained and polished choral tone of this realisation [of Cardew's 'Treatise'] suggests elaborate preparatory coordination among the group's singers. The outcome is broadly reminsicent of the Natural Sound Workshop, an ebullient open to all vocal ensemble [from] the early 1970s. ... The Vocal Constructivists look set to perform some valuable work."